The language used in prior editions of the NFPA 58 code often led inspectors and local authorities to classify skid tanks as “temporary installations” and as such limited to 12 months in a single location. Over the years, this interpretation of the code has prevented many propane marketers from utilizing skid tanks as an alternative to building a more traditional bulk plant from the ground up. Very few propane marketers were interested in the idea that they would have to move their bulk storage tank every 12 months. This all changes with the 2017 edition of the code. A container that is designed and fabricated with permanently mounted skids or runners that is not designed to transport LP-Gas. More importantly, NFPA 58-2017 edition, paragraph 6.6.2.2 allows for “permanent installation of skid tanks”. Although skids are portable storage, in the field most are installed as part of a new bulk plant or expansion to an existing facility and intended for long-term, not temporary use. It all starts with a tank built on a metal frame or skid. The primary intent for the frame is to provide a support for the tank, pump, piping and bulkhead. Without the frame, the various components of the bulk plant have to be installed separately which results in longer lead times and often additional costs. Skid tanks with pump, valves, piping and bulkhead included are often referred to as “turnkey” since they only require an electrical connection prior to operation. 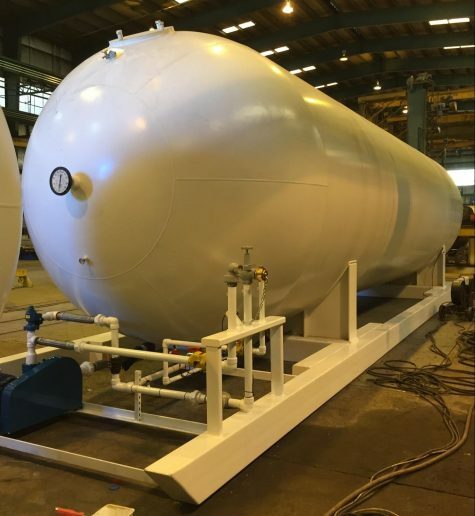 This long awaited update to the code clears the way for propane marketers to benefit from the speed and ease of installation offered with a skid tank without the concern of having it classified as a temporary installation. The maximum elevation of a skid tank with non-fireproofed steel supports above the concrete foundation is 18 in. For our skid tanks, the distance from the bottom of the container to the top of the skid/frame is 5-3/4″ and the height of the frame is 12″ so total distance is less than 18″ which meets the maximum elevation requirement. Some state inspectors or local authorities may not be aware of these changes. Others may not have adopted the NFPA 58-2017 edition yet. However, we’ve found that most are willing to listen and can be persuaded to rethink policies related to skid tanks once educated on the current code and standards.